in all of South Florida! 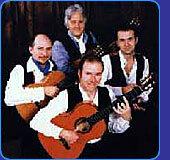 A Gipsy Kings-style band offering authentic rumba, latin and flamenco music for all occasions. Appearing regularly at the hottest clubs in South Beach; Gentle background music or a lively evening of vibrant song and instrumental music for dancing. The band is available from a three-piece to a six-piece to suit all budgets and venues. Barton G’s favorite! Adelante has developed an innovative new sound that touches upon a diverse range of music genres and styles, including: salsa, merengue, bachata, jazz, world music, top 40, pop, rock, and much more. 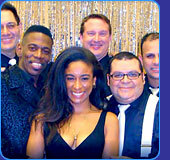 The perfect band for guests who love to dance immersed in the Latin rhythms even during American songs. This young, energetic band is fun to watch and draws people to the dance floor. The band can perform in a variety of configurations but the full band with it’s horns and percussion section is a real energizer for any celebration! 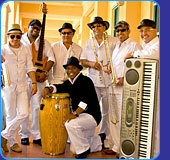 High energy and very danceable, they are one of the mainstays of “South Beach” hot spots! They have played rave-review performances for major corporate events, country clubs, festivals, and concerts. Authentic Latin as well as rocking American music. 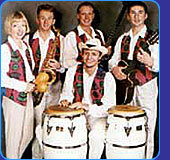 This band provides the best in authentic Latin Cuban Dance music. From the sophisticated Afro-Cuban jazz to the modern sounds of Salsa, Samba, Lambada, & Afro-Carribean reggae, the range of music played bears testament to the great musicianship & talent on stage. 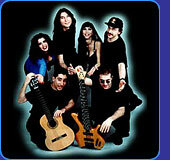 South-American Latin Band from Argentina, performs mostly original and Latin covers: dance music, mix of flamenco, salsa, rumba, bossanova, mambo, latin pop and rock; original classical guitar music, romantic ballads (English/Spanish), and cover tunes, for all kinds of events and parties. Contact us for Samples of the music and artists bios. This Latin Band’s eclectic repertoire is passionate, dynamic and eminently danceable: from the characteristically hot-blooded tempos of Cuban Salsa and Brazilian Lambada, to the traditional folk rhythms of Colombian Cumbia and Dominican Merengue. 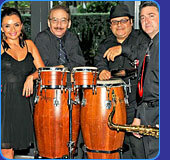 This is the only band in South Florida that is equally adept at Latin AND Tropical music! The hottest beach party music around: from Bob Marley and the Beach Boys to Meringue and Salsa to Cumbia and Samba! With a killer three piece rhythm section, a Jimmy Buffett-style front man, a Latin female vocalist, and the very best sax player in Miami! 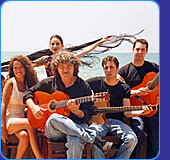 Surfside Six plays only the best LATIN AND AMERICAN beach-party music designed to get your guests on the dance floor. They’ve become one of the most sought after bands in South Florida because of their incredible high-energy versions of today’s most popular Latin artists. They will enhance the look and feel of your event with fabulous, authentic music and great stage presence as well. This band is very much a part of the Miami record industry creating original music as well.